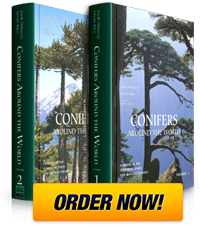 Conifer expeditions - Mexico 1. Mexico, with its 93+ species and varieties of conifers, is a very special place for any conifer explorer and was a must place for our Dendrological Atlas project. Given the goal – documenting possibly all conifer taxa in Mexico within a realistic time frame – seemed and was indeed a huge task. Careful planning and adequate funding was needed to prepare our trips; we had to find a base camp, look for good vehicles, helpful guides, expedition gear and more. For our Dendrological Atlas team – drs. Zsolt Debreczy, Gyöngyvér Biró, István Rácz, the door was opened by professor Boone Hallberg of Ixtlán de Juárez, Oaxaca, who provided us with the initial guided tours in central Oaxaca (November 1990) and later, with a perfect base camp for our subsequent Earthwatch- and IDRI-supported expeditions between 1991 and 2004. Mr. Hallberg was also our main advisor in all matters of our activity in Mexico. Prior to the actual work, we had to get collecting permit from SEDUE (Secretaría de Desarrollo Urbano y Ecología), and had to make arrangements with a number of organizations and institutions. During the travels and explorations we were greatly assisted by Professor Jerzy Rzedowski and Dr. Sergio Zamudio Ruiz, Instituto de Ecología A.C., Centro Regional de Bajío, Pátzcuaro, Michoacán; Professor Enrique N. Guízar, Division de Ciencias Forestales, Universidad Autonoma Chapingo; Professor Jorge A. Pérez de la Rosa, Instituto de Botánica, Zapopan, Jalisco; Gustavo Ramírez Santiago, Director General, Corredor Biológico Mesoamericano–México, Comisión Nacional para el Conocimiento y Uso de la Biodiversidad, Tlalpan, México, D.F. ; and staff members of local forestry and conservation organizations such as (with their acronyms) CONACYT, INIFAP, SARH, SEDESOL, and UCODEFO. Many thanks to them! – Later, we will post details of our memorable explorations on this site. 2. Our base camp on Boone Hallberg’s Rancho Teja, near Ixtlán de Juárez, with the “casita” that provided home for the indoor work and served as the kitchen and dining room, bathroom, herbarium storage; the volunteers’ tents were set up in the surrounding area.